It’s Holy Week, and I find myself wanting it to be some huge spiritual experience. And as with every other week of Lent, it is in the ordinary and the commonplace, and the day to day where Jesus keeps on showing up. Body and blood. God with us. I’m going to be charitable to myself and say that I didn’t do the best at my Lenten goals this year. Other than a successful fast, I think I only did any of my other proposed activities a handful of times, if that. And I feel this tension, pulling me. That same tension that pulled me when my husband invited me into feast day tv watching. The tension between propping myself up with my works and freely receiving grace. Between chastising myself for failing and thanking God for the ways he has been present. I had a lot of good plans for observing Lent this year. Plans that came from a good place. Plans that I was excited about. Plans that I think I’ll probably try to make again. But can I say that my failing has been the place where Lent has been so meaningful? Every day, when I see the unopened devotional email I was supposed to read, or I realized that Eliana ripped her “Lenten Path” paper in half, and it’s hanging there sad on the side of our fridge, I remember that sin is a part of me, that brokenness is where we live. And I remember grace. I remember mercy and forgiveness and redemption. 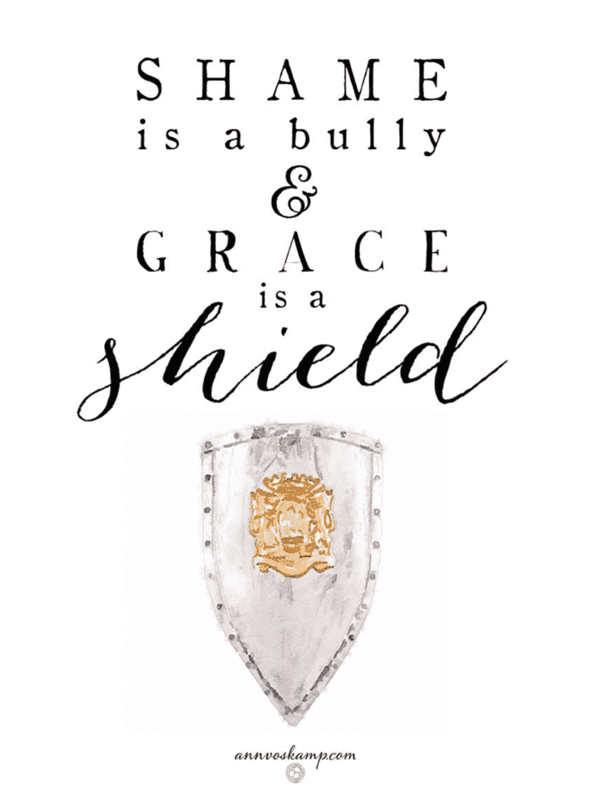 I don’t think a day has gone by since Ash Wednesday that I haven’t breathed thanksgiving for that shield of grace that Jesus bought for us with his blood. Now I realize that it’s not necessarily sin that I don’t read all that I planned to or do all the activities that I planned with my kids. I don’t think it’s sin to have a messy house or to get behind on the laundry or to forget that you have company coming. But, oh how those things remind me of how flawed I am! How broken I am. How I fall short in ways that really do matter. Like being holy. And this morning, when I did read Walt Wangerin’s Maundy Thursday devotional with cat piano background music and a room-temperature cup of coffee, I felt a little twinge that I haven’t made reading a priority. That I didn’t make more of an effort to anticipate. To participate. But it was a different kind of pain than the kind of pain I am so used to feeling when I realize that I’m not enough. When I remember that I’m broken to the very core of me. It was a hunger pain more than a stifling pain. A growing pain more than a crushing pain. An ache for more Jesus instead of a desperate grasp to be good, do it better, try harder. Instead of my mind being filled with all the ways I have fallen short, it is filled with all the ways that he has been faithful with my broken little obediences. The ways that he has given himself to me. How he has been Immanuel, the God who came to live with us. When I look back at the weeks between Ash Wednesday and today, I realize that I have to choose what story I tell, I have to choose where my heart is going to focus. The story of my failure or the story of His grace? The story of my dirty feet or the story of how he washed them? The story of my sin, or the story of his redemption? Because really, aren’t they the same story?